How many times have I heard that familiar refrain in my mind as I try to reconcile the poverty I see in Burundi with the wealth I see in America? A humbling experience at this summer’s widow’s retreat showed me that our Burundian sisters may understand their blessings better than we do. It had been a long day- a long week at that! We had come to the closing ceremonies for the widows’ retreat. I was tired, but trying to keep up. The energy of the 876 widows and their children packed tightly in the hot church was palpable. Dirt and sweat filled the air; kicked up by the joyous pounding of dancing feet and clapping hands. I looked to Joy, our national director, as she stood up to speak. I expected to hear her final words, signaling the end of the ceremony. But her words quickly became lost in the sounds and rhythms of the music and singing. Many of the widows stood up and began singing and dancing as they made their way towards the front of the room. I could see they were balancing something on their heads. As they got closer, I realized they were carrying bags of beans. Behind them came women with beautiful baskets on their heads, filled with food, and balanced with ease. One by one, my sisters began stacking a pile of beans and rows of baskets on the side of the stage. The power of the moment silenced my spirit. In a country that is amongst the poorest in the world, from women who are among the poorest in the country, they were giving an offering to the poor. At this point everyone was on their feet, including me. 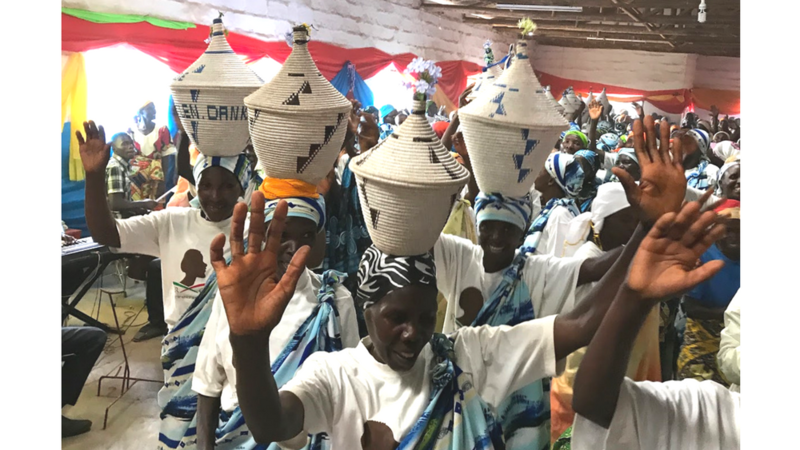 One after another, the widows who have suffered the most from Burundi’s poverty, brought forward gifts for those with even less. Their faces were filled with smiles as the pile of beans grew larger and larger, and the offering box filled with Burundian francs. They remember what it was like, waiting for a sponsor to come along side them, to help them rise above their devastating circumstances. And so with their offering they remembered those still waiting for a second chance. They understand the love and mercy they have received from God, and they were eager to share it with others. but they gave them with joy filled hearts. I could not help but reflect on how often I have given reluctantly, even from my relative abundance. These women gave freely in spite of the scarcity that defines their lives. They made true sacrifices for the well being of others. Their lives reflect the way of Jesus, joy in sacrifice. I’m quick to think of “blessings” as material things. But our Burundian sisters have been truly blessed with great faith, and their faith is a blessing to me.